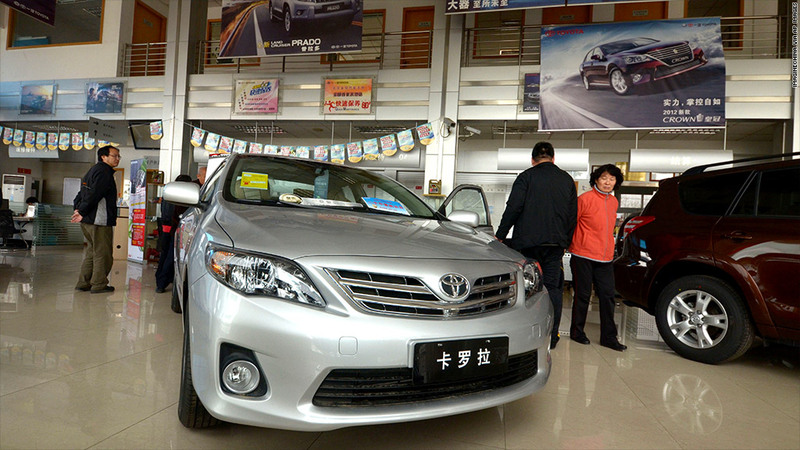 A Toyota dealership in China, which is the world's largest market for car sales. Toyota Motors retained its title as the world's largest automaker in 2013, and the Japanese company said this year it would become the first ever to sell 10 million vehicles. On Thursday, Toyota (TM) reported it sold 9.8 million passenger vehicles, up about 2% from 2012 and just ahead of the 9.7 million cars and trucks sold at No. 2 General Motors (GM) and 9.5 million sold at Volkswagen AG. GM and VW both narrowed the gap with Toyota, however. GM reported a 4% gain in and VW's passenger car sales rose 5%. Toyota also set a 2014 sales goal of 10.1 million passenger cars. It forecasts it sales in Japan to decline and its overseas sales to rise. Still, Toyota has a large lead in Japanese sales over its global rivals. But it trails GM and VW in China sales and lags GM and Ford Motor (F) in U.S. sales. Experts say that overall business will improve this year in both China and the United States, the two largest markets. U.S. vehicle sales are expected to top 16 million for the first time since 2007, up from 15.6 million in 2013. Sales in China, which last year became the first country to hit 20 million vehicles, are expected to reach 22.6 million vehicles in 2014, according to forecaster IHS Global.